Fettlin shed, here I come. Do you think they could be made to work with rim brakes? I guess you'd need more, shorter transverse chains to keep tension wire away from the rim. I like the looks of the claws on the Koolstop Kwikclaw ones over the chains of the homemade one. But the way of attaching the homemade ones with cable ties round the rims is great (unless you want to take them on and off while out for a ride). I'm using studded tyres when it's icy at the moment. You could make a home made studed tyre/chain hybrid by taking an old knobbly tyre, chopping it into short sections (say, 5-10cm), putting some studs (e.g. screws) in and then attaching to the wheel in the same way as the home made chains. It would probably be crap on the road, but fine for short trips in the snow and ice. Those studded tyres - what are they like on the road? I'd like something that would allow me to do road riding when it's icey so that I am less afeared of going over on the odd patch of ice that I meet. Studded tyres sound good but i'd be worried that the studs would either wear out really fast on the none icey bits, or make handling a pig. The Peter White Cycles site is quite informative about studded tyres. Those studded tyres - what are they like on the road? I'd like something that would allow me to do road riding when it's icey so that I am less afeared of going over on the odd patch of ice that I meet. Heavy, like unto a pig, on tarmac. IMO, for riding when roads are iced over, not for riding with "whoops a patch of ice". Those studded tyres - what are they like on the road? Like andygates says. They are heavy pigs on the road (but the tread alone on the tyre I have would make them terrible on the road, and more road oriented studded tyres are available). I'll post a proper review at the weekend, once I've had more of a chance to test them (big freeze on the way). For DIYing and occasional road use, perhaps a spray on resin would help. I'm using studded tyres when it's icy at the moment. You could make a home made studded tyre/chain hybrid by taking an old knobbly tyre, chopping it into short sections (say, 5-10cm), putting some studs (e.g. screws) in and then attaching to the wheel in the same way as the home made chains. It would probably be crap on the road, but fine for short trips in the snow and ice. Those studded tyres - what are they like on the road? I'd like something that would allow me to do road riding when it's icy so that I am less afeared of going over on the odd patch of ice that I meet. Studded tyres sound good but i'd be worried that the studs would either wear out really fast on the none icey bits, or make handling a pig. I'm quite confident those chains will be totally useless on ice or packed/frozen snow! You'll get better grip and lower resistance if you fit some 2.5" or upwards. Used different studded tires since -91 and can recommend 26" Nokian Hakkapeliitta W240! There's still nothin' that can beat the versatility of these even if there are some with more studs and wider thread for XC/DH. Might give myself some Schwalbe Marathon Winter 700c for Christmas though. Reason is they have slightly lower resistance but chare the four rows, double that of the cheaper tires, with studs that is needed for reliable grip when cornering in freezing temp. As mentioned you can make diy tires but it's a hassle and they only last a few rides so you can't really trust 'em, yes I've tried. Used four month per year on a daily basis the studded tires of Nokian last about three seasons witch I think is cheap. Just make sure you ride them at slow speed for a while on bare ground for the studs to settle in, or you'll lose some. Do stop messing about and get some proper tyres!!! 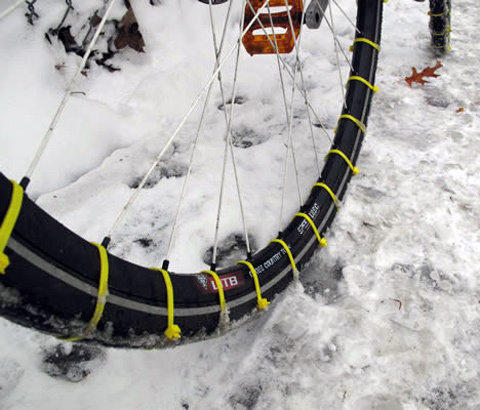 You know, someone was telling me about his plan one winter to make his own studded tyres by using hefty MTB tyres, hammering nails etc through the carcass and sealing the gaps with gaffer tape. It would have been complete overkill for Newcastle winters, so he never did it. That's the bit I was wondering about - don't mind really heavy or chunky tyres (I've used a Panaracer Spike as my rear on the road before now: you know, the one that comes with a health warning on it), but was wondering if the non-iced bits of road would wear the studs down too quick or if the studs would make the wheel slide about on non-iced sections. Might give it a go....have a spare box of pop rivets somewhere. Proper studded tyres should be fine on normal roads, they've been used by car drivers for decades, if there was any risk, the manufacturers would have been sued into oblivion by now. 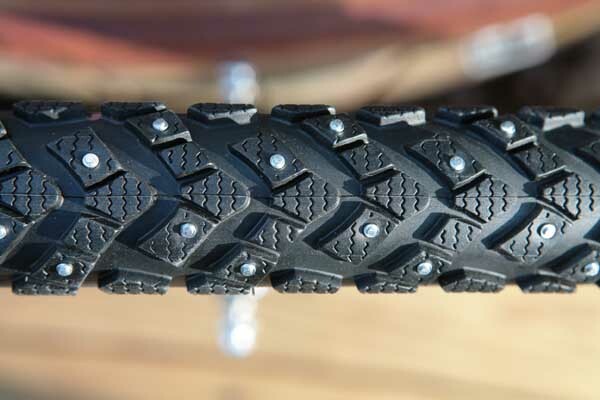 The studs are typically carbide steel, the rubber tyre will wear out far before the studs do, although apparently there is a risk of the stud being ripped out if you ride too aggressively when not on snow/ice. The biggest issue is probably the additional rolling resistance of a big chunky tyre, and the additional cost (not to mention availability in the UK). Yup, one gear down is the norm! But if it's the difference between being out on your bike and arriving in one piece or not, then rolling resistance is a non-issue! I know nothing about studded tyres. And I have no faith in my ice-riding. I live in Oxfordshire, where we get a few icy mornings/nights every winter. If I ride in those conditions it will probably be an on-road 'utility' journey, so speed isn't an issue, but arriving in 1 piece is. I won't do many miles. I don't mind if the tyres sit in the garage for 10-11 months every year, cracking before I wear them out. I could use narrow 700s or 26" (ideally upto 1.75 for the hybrid to cope), not too fussed. Help - what tyres should I get (that are obtainable/affordable in the UK)? The Nokian Hakkapeliitta W106 tyres seem to be available (sometimes) in the UK, and are oft quoted as being an on-road studded tyre for use in somewhat icey conditions. I haven't ever used them, in London it seems rare to have ice and not have the roads gritted, but I think I'd try a pair of these if I was interested in being a bit more ice proof, and didn't mind spending £70 odd for the privilege. I did see one review of these tyres, where the guy mentioned that the only problem he had was riding on slushy snow on a wooden pier at 15mph, but that this would have been challenging for any tyre! I think I'd want a second set of wheels, since that would be a lot easier to change over than buggering about with tyre levers on a cold morning! and didn't mind spending £70 odd for the privilege. Yeah, but there's none in stock. I was looking at 700C ones more than 26", since that's what I'm using these days. Suitable tyres for road bikes seem to be even harder to find in the UK than MTB ones. I'd need very narrow tyres on 700, so I'm not expecting to find anything suitable. Given the discussions elsewhere about next year being the big cold one we've been waiting for, maybe I should buy myself a set in June, maybe July. The should have some stock in then! I think 700x35 should probably fit my SingleSpeed, although I may need to add an additional link in the chain, since the wheel is a bit close to the down tube at the moment. This has to be the least seasonable thread ever. Don't forget to check out the DIY studded tyres thread. They work. I rode down a flight of ice-covered steps with them as a test. The only time they got a bit out of their depth is on the really thick glassy black ice, the sort you can't even stand up on, but although traction was lacking I didn't actually fall off. A few more central studs would probably have solved that, too.